It’s eerily quiet at the Johannesburg Art Gallery (JAG) on a Tuesday morning. The only people around are the few staff that the gallery can afford to employ and two men sitting on a bench in the main entrance, getting some peace and quiet from the busy city surrounding them. It’s understandable that there aren’t many people in an art gallery on a weekday morning, but ,come Saturday afternoon, the gallery has still but a few visitors. The continuous decline of the Central Business District (CBD), where the gallery is located, has meant that the largest gallery in Africa is now only visited on a rare occasion. Its visitation numbers have been on a steady decline and nowadays the gallery only sees a crowd at exhibition openings a few times a year. The CBD has, over the years, become plagued by crime and traffic congestion, making it a less than perfect area to visit for tourists and locals alike. 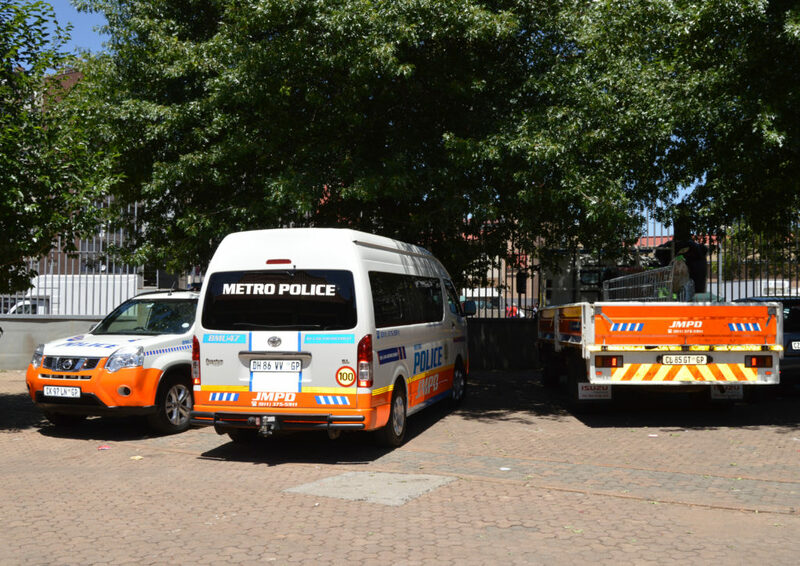 Visitors are often intimidated by the traffic surrounding the gallery and many people living around the CBD go right past it, assuming the gallery is a police station because of the large number of Metro police vans parked outside. APPARENT POLICE STATION: Metro Police vans park outside the gallery daily, giving the impression that it is, in fact, a police station. Once entering the gallery though, it seems worlds away from the bustling, congested Klein Street just 50 metres away. Tara Weber, the interim director of the gallery, sits in an outside courtyard having a smoke break, and the only noise to be heard is that of birds singing. Weber, who has been the interim director of the gallery since the abrupt exit of former Chief Curator Antoinette Murdoch, is animated when talking about the exhibitions but does not gloss over the serious problems experienced either. Weber has high hopes for the gallery, including more educational programmes for young people and the use of their once popular Art Bus. “There are really big struggles, I think, being a municipal gallery in general, because we don’t have the direct access to the main [Department of] Arts and Culture budget. We all sort of have to fight for one budget,” said Weber. 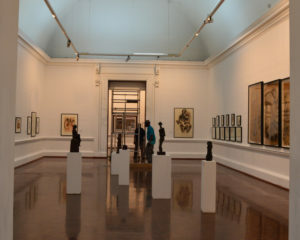 The gallery’s incredible collection of art is often loaned to galleries for exhibitions around the world, many of which have been incredibly successful. 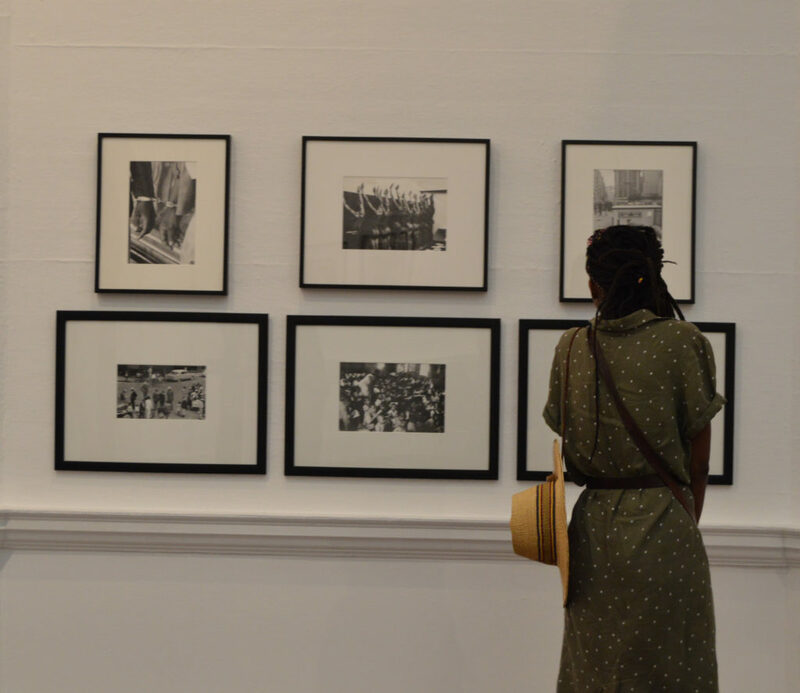 The loans generate international exposure for both the gallery and South African artists, but do not provide an income and don’t help in encouraging locals to visit the gallery. The JAG, which celebrated its centenary last year, had six massive exhibitions that showcased its impressive permanent collection. The initial collection, which has now grown to over 10 000 pieces, was first started by Lady Florence Phillips in 1910. Phillips, the wife of a wealthy Randlord, had the intention of displaying the works in a yet-to-be-designed gallery. “To put it in perspective, if we were to fill the entire gallery wall to wall and ceiling to floor, it would still only be about 2% of the collection. That’s why I appreciate the loans so much – because then the art is actually seen,” said Weber about the massive collection at the JAG. QUIET SPACE: The gallery offers benches and a quiet space that allows visitors a moment of peace. The original building was designed by British architect Edwin Lutyens and in 1915 the doors to the unfinished gallery were opened. Since then, the East and West wings, which were in Lutyens’ original design, have been completed. In 1986 the gallery underwent a massive extension which effectively doubled its size. With the extension complete, the gallery now boasts 15 exhibition rooms. The new extension, designed by Meyer Pienaar and Associates, has managed to mesh the grand high-ceilinged rooms designed by Lutyens with smaller, more modern rooms. The extension has not been without its problems though. The copper roofing, which was added to the extension, has been stolen numerous times, presumably to be used as scrap metal. This has resulted in a stream of continuous leaks and a serious dent in the JAG’s maintenance budget. The process to have funding allocated to an exhibition is a lengthy one and numerous reports have to be submitted to seniors before funding can be approved. However, funding for the JAG was cut regularly after money had already been allocated and exhibitions had been budgeted for, said Murdoch. “We didn’t have toilet paper! Only one of the seven years I worked there we had a gardener, the rest of the time we had to beg people to help!” said Murdoch who still feels very emotional about her experience at the gallery. Weber speaks frankly about the problems citing both an overstretched budget and a lack of support from members of the public. “I think people are more willing to fund stuff that is more glamorous looking. So in terms of funding it’s not a huge drawcard because they don’t want to be associated with this area, I don’t know, which is quite sad, I think,” said Weber. The gallery has had many struggles, over the years, attempting to keep the degradation at bay while many other areas of the CBD have not been as lucky. The city is now riddled with decaying, boarded up buildings and the massive gallery has not been immune to the degradation. Weber said that this is a very public space that allows people to use the gallery for a variety of reasons, even if they do not fit the norm of a gallery’s typical functions. Photographers from Joubert Park often use the gallery’s courtyards to take photos in front of sculptures and school children are provided a safe space to do their homework. Joubert Park, which is connected to the gallery via its North Entrance, is a complete contrast to the gallery. While the gallery has few visitors on a weekday afternoon, the park is filled with people. Groups of men gather to watch a game of chess, children mill about in their school uniforms and hawkers sell sweets and chips around the park. David Selepe has been one of the park photographers for 32 years and regularly uses the gallery to take photos. “It’s very nice there. A lot of people don’t go because when it was apartheid we weren’t allowed and now when we tell people they can go they are surprised and they want to walk around,“ said Selepe. EXHIBITION OPENING: The opening of two exhibitions draws a large crowd of art lovers to the gallery. The JAG recently appointed an education officer, Colin Groenewald, with the intention of creating more projects that encourage youths to visit the gallery and get involved in the arts. The funding for large programmes doesn’t come cheaply though, and their budget for educational programmes was cut right before his appointment. “The money we got for education was minimal, so small I don’t even want to say it. Sometimes we would have to take money we made from exhibitions to use for programmes,” said Murdoch. The gallery’s first educational workshop this year encouraged school kids to write their responses to exhibitions on a wall covered in chalkboard paint. “The workshop was filmed and photographed, and the idea is to use this footage to apply for funding for further educational sessions. Chalk has been left in the workshop room, and we invite the public to voice their own opinions,” Groenewald told Friends of JAG, a group dedicated to raising money for the gallery. “It’s really nice because it’s engaging with kids who are in the area but had never been to the gallery before. We had a whole space where they could write on the walls and, I suppose, take ownership of the gallery,” said Weber. OPENING SPEECH: Tara Weber, the interim director of the gallery addresses a large crowd at an exhibition opening. Municipal galleries play tug of war with the funds allocated, with each gallery trying to ensure it receives enough funding to keep it going. The funding is, of course, never enough to meet everyone’s needs and while maintenance costs pile up, budget allocations go down. Weber’s belief that the gallery might be cursed might not be entirely wrong. 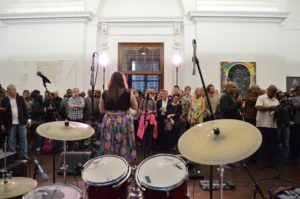 Maintenance troubles aside, the gallery has experienced a serious shortage of staff which is highlighted by the fact that the gallery currently does not have a permanent chief curator. Weber said the gallery currently only has 30% of the staff that it needs to run properly. Murdoch said that the lack of funding for exhibitions and maintenance really affected the ability to do her job. The last straw for Murdoch was when a two-year plan to exhibit works from Reunion, a small island off the east coast of Africa, had to be cancelled at the last minute because their funding was cut. The lack of funding required to hire a new director has been, among other problems, one of the biggest downfalls of the gallery. Lack of solid leadership has meant that other employees are required to fulfil many roles at once. Small details are overlooked and creativity when curating collections is limited. The one thing the gallery has no shortage of is money to acquire new artworks, thanks to a generous trust started by Anglo-American. 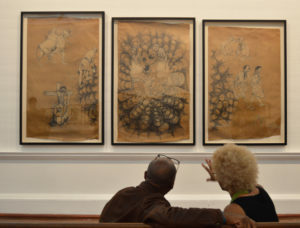 Their collection will continue to grow and under Weber’s temporary direction, will gather more Pan-African contemporary art as well as encourage a space to foster more artists. The passionate staff at the gallery and the art lovers who are committed to helping them have been fighting an uphill battle. The continual lack of funding for the gallery has made it increasingly difficult to put on exhibitions. The Anglo-American trust will allow the staff at the JAG to grow the incredible collection of art for many years to come, but a lack of funding for vital materials such as nails and paint might prevent the artworks from ever being exhibited.